This best-selling edition is deal for schools, CCD and study groups. 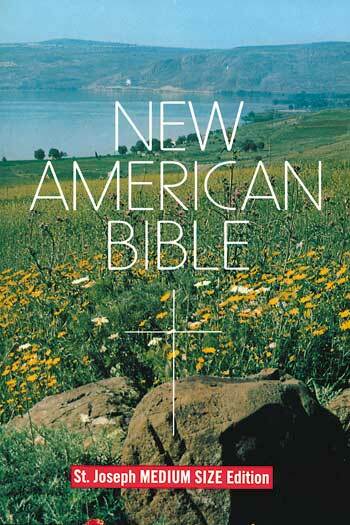 The medium-size student edition of the St. Joseph New American (Catholic) Bible from Catholic Book Publishing is the most popular medium-size student paperback edition available. Includes the complete Old and New Testaments in a large, easy-to-read 9-pt. type. Contain s any helpful aids for easy Bible reading, including a valuable Bible Dictionary, self-explanatory maps, a doctrinal Bible Index, and complete footnotes and cross-references. The user-friendly (5 1/2" x 8 1/4") size, flexible, durable paper cover, and handy edge-marking index make Catholic Book Publishing's St. Joseph New American Bible Medium-Size Student Edition ideal for schools, CCD, and study groups.